« Did the Apostle Peter hold to Church of Rome or Church of God doctrines? IRAN vowed not to curb its missile arsenal in a further show of defiance to Donald Trump after demands from the United States. A senior Iranian Revolutionary Guards commander threatened Israel with destruction if it attacks Iran, state media reported on Monday. Brigadier General Hossein Salami spoke out after Israeli strikes in Syria last week and warned the country any attempt to start a war “will lead to its own elimination”. The airstrike killed 11 people in bombing raids on what it believes were Iranian military basis inside war-torn Syria. 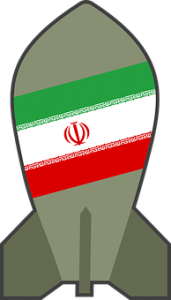 Iran’s minister of defence Amir Hatami warned its missile capabilities are non-negotiable. He dismissed a call by European countries and the US that the missile technology should be diminished. The idea of “unintended military escalation” is consistent with my long held view that there would be “unintended consequences” for various policies and actions from US President Donald Trump. Elam looks to be a reference to at least some in Iran. Kir is of interest as it has several possibilities. One is that the Bible tells that after Tiglath-Pileser king of Assyria took over Damascus, he moved Syrians to Kir. While this does not mean that Kir must (or must only) be a reference to Syria, the fact that Syria is a close ally of Iran is interesting. Some believe Kir is an area in the south of Iran, while others suggest closer to the Black Sea. The Bible tells of a time when Kir will be destroyed (Isaiah 15:1b) and also says that Syria’s capital Damascus will be destroyed (Isaiah 17:1). Russian Prime Minister Dmitry Medvedev said new US sanctions would be a declaration of economic war. Iran, North Korea, China, Europe, and Turkey are also upset about USA sanctions and tariffs. A Turk asserted “Somebody must find a solution and stop the USA.” The BRICS nations see US sanctions and tariffs as helpful to their objectives to trade without the USA. Are “unintended consequences” of USA policies threatening the current Anglo-American world order and leading to a New World Order? What has ‘Lord’ Jacob Rothschild and Russian President Vladimir Putin stated? Does Bible prophecy show that a confederation of Turks, Arabs, and Europeans pose a real threat to the USA and UK? Is the final time of the Gentiles coming? Will it be worse than people imagine? Dr. Thiel addresses these issues and more. Iran is believed to have EMP (electro-magnetic pulse) bomb capability–which could damage at least parts of the USA. Iran may also align with other Islamic nations to cause terroristic and other damage to the USA. Yes, decisions and statements by US President Donald Trump will be a factor in Iran’s actions–though not the only one. Yet, there will also be many more “unintended consequences” of his policies and practices. But the Iranian matter is NOT WWIII. Yet, it may result in negotiations of a ‘peace deal’ which will effectively serve as a countdown to World War III and the end of the USA. This entry was posted on Tuesday, January 29th, 2019 at 7:30 am	and is filed under Prophecy. Iranians celebrate the future taking over of Jerusalem with ballistic missile display: Does the Bible show that Iran could greatly damage Jerusalem?